Scandinavian Airlines, usually known as SAS, is the flag carrier of Sweden, Norway and Denmark, which together form mainland Scandinavia. SAS is an abbreviation of the company's full name, Scandinavian Airlines System or legally Scandinavian Airlines System Denmark–Norway–Sweden. Part of the SAS Group and headquartered at the SAS Frösundavik Office Building in Solna, Sweden, the airline operates 169 aircraft to 123 destinations. The airline's main hub is at Copenhagen-Kastrup Airport, with connections to 109 destinations around the world. Stockholm-Arlanda Airport (with 106 destinations) is the second largest hub and Oslo Airport, Gardermoen being the third major hub of SAS. Minor hubs also exist at Bergen Airport, Flesland, Göteborg Landvetter Airport, Stavanger Airport, Sola, and Trondheim Airport, Værnes. SAS Cargo is an independent, wholly owned subsidiary of Scandinavian Airlines and its main office is at Copenhagen Airport. In 2017, SAS carried 28.6 million passengers, achieving revenues of 40 billion Swedish kronor. This makes it the eighth-largest airline in Europe. The SAS fleet is composed of 157 aircraft consisting of Airbus A319, Airbus A320, Airbus A320neo, Airbus A321, Airbus A330 and Airbus A340; and Boeing 737 Next Generation aircraft. SAS also wet leases Airbus A320neo, ATR 72, and Bombardier CRJ900 aircraft. 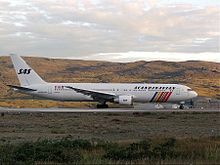 The airline was founded in 1946 as a consortium to pool the transatlantic operations of Swedish airline Svensk Interkontinental Lufttrafik, Norway's Det Norske Luftfartselskap and Det Danske Luftfartselskab of Denmark. The consortium was extended to cover European and domestic cooperation two years later. In 1951, all the airlines were merged to create SAS. SAS has been described as "an icon of Norwegian–Swedish–Danish cooperation". On 27 June 2018, the Norwegian government announced that it had sold all its shares in SAS. In 1997, SAS was a founding member of one of the major airline alliances, Star Alliance. The airline was founded on 1 August 1946, when Svensk Interkontinental Lufttrafik AB (an airline owned by the Swedish Wallenberg family), Det Danske Luftfartselskab A/S, and Det Norske Luftfartselskap AS (the flag carriers of Denmark and Norway) formed a partnership to handle the intercontinental air traffic of these three Scandinavian countries. Operations started on 17 September 1946. In 1948 the Swedish flag carrier AB Aerotransport joined SAS and the companies coordinated European operations and finally merged to form the SAS Consortium in 1951. When established, the airline was divided between SAS Danmark (28.6%), SAS Norge (28.6%), and SAS Sverige (42.8%), all owned 50% by private investors and 50% by their governments. In 1954 SAS was the first airline to start scheduled flights on a polar route. 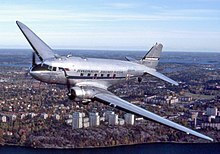 The Douglas DC-6B flew from Copenhagen to Los Angeles with stops in Søndre Strømfjord (now Kangerlussuaq) in Greenland and Winnipeg in Canada. By summer 1956 frequency had increased to three flights per week. It was popular with Hollywood celebrities and film industry people, and the route turned out to be a publicity coup for SAS. Thanks to a tariff structure that allowed free transit to other European destinations via Copenhagen, this trans-polar route gained increasing popularity with American tourists throughout the 1950s. In 1957 SAS started a second polar route when a Douglas DC-7C flew from Copenhagen to Tokyo via Anchorage International Airport in Alaska. The flight via Alaska was a compromise solution since the Soviet Union would not allow SAS, among other air carriers, to fly across Siberia between Europe and Japan, and Chinese airspace was also closed. SAS entered the jet age in 1959 when the Sud Aviation Caravelle entered service, with the Douglas DC-8 then joining the fleet the next year. In 1971, SAS put its first Boeing 747 jumbo jet into service. SAS gradually acquired control of the domestic markets in all three countries by acquiring full or partial control of local airlines, including Braathens and Widerøe in Norway; Linjeflyg and Skyways Express in Sweden; and Cimber Air in Denmark. In 1989, SAS acquired 18.4% of Texas Air Corporation, parent company of Continental Airlines, in a bid to form a global alliance. This stake was later sold. During the 1990s, SAS also bought a 20% stake in British Midland. SAS bought 95% of Spanair, the second largest airline in Spain, as well as Air Greenland. An agreement to divest more than 80 percent of the holdings in Spanair was signed with a Catalan group of investors led by Consorci de Turisme de Barcelona and Catalana d'Inciatives in January 2009. In May 1997, SAS formed the global Star Alliance network with Air Canada, Lufthansa, Thai Airways International, and United Airlines. Four years earlier SAS unsuccessfully tried to merge with KLM, Star Alliance partner Austrian Airlines, and the now defunct Swissair, in a project called Alcazar. This failure led to the departure the following year of CEO Jan Carlzon, who was credited for the financial turnaround of the company starting in 1981 and who envisioned SAS ownership of multiple airlines worldwide. The ownership structure of SAS was changed in June 2001, with a holding company being created in which the holdings of the governments changed to: Sweden (21.4%), Norway (14.3%), and Denmark (14.3%) and the remaining 50% publicly held and traded on the stock market. In 2004 Scandinavian Airlines System (SAS) was divided into four companies; SAS Scandinavian Airlines Sverige AB, SAS Scandinavian Airlines Danmark A/S, SAS Braathens AS, and SAS Scandinavian International AS. SAS Braathens was re-branded SAS Scandinavian Airlines Norge AS in 2007. In October 2009 the four companies were once again united into one company, SAS Scandinavian System AB. With the coming of low-cost airlines and decreasing fares in Scandinavia the business turned into the red. To be profitable again, the airline had to cut costs. In a first step the airline sold its stakes in other companies, such as British Midland International, Spanair, and AirBaltic, and began to restructure its operations. This was to save costs by about 23 percent between 2008 and 2011. In November 2012 the company came under heavy pressure from its owners and banks to implement even heavier cost-cutting measures as a condition for continued financial support. Negotiations with the respective trade unions took place for more than a week and exceeded the original deadline, but in the end SAS and the trade unions reached an agreement that would increase the worktime, cutting salary between 12-20%, pension and retirement plans, and thus keep the airline flying. SAS drew some criticism for how it handled the negotiations, in denying facilities to the union delegations. In 2017, it was announced that SAS would form a new airline, Scandinavian Airlines Ireland, operating out of Heathrow Airport and Malaga Airport to fly European routes on its parent’s behalf using nine new A320Neo aircraft. 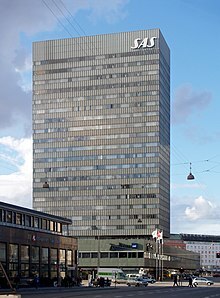 During its first decades, the airline built two large hotels in central Copenhagen, SAS Royal Hotel (5 stars) and the even larger SAS Hotel Scandinavia (4 stars with a Casino on the 26th floor). After the deregulation of European commercial aviation, and the crisis afterwards which affected SAS, like many other national airline corporations, Scandinavian Airlines sold its hotels to Radisson. Scandinavian Airlines' head office is located in the SAS Frösundavik Office Building in Frösundavik [sv], Solna Municipality, Sweden, near Stockholm. Between 2011 and 2013, the head office was located at Stockholm Arlanda Airport (ARN) in Sigtuna Municipality, Sweden. The SAS Cargo Group A/S head office is in Kastrup, Tårnby Municipality, Denmark. The SAS Frösundavik Office Building, was designed by Niels Torp Architects and built between 1985-1987. The move from Solna to Arlanda was completed in 2010. A previous SAS head office was located on the grounds of Bromma Airport in Stockholm. In 2013 SAS announced that it once again would relocate to Frösundavik. Besides the agreements SAS has with its Star Alliance partners, SAS has strategic agreements with Lufthansa, Swiss International Air Lines, Austrian Airlines, Air Canada, and United Airlines. The agreement includes codesharing and schedule coordination to facilitate improved connections between SAS and its partner airlines. SAS also co-operates with the other airlines in the SAS Group. These statistics about each of SAS hubs and busiest airports are current as of W17/18. (Ranked by weekly departures). Airbus A319-100 4 — 0 0 150 150 One painted in retro livery. Airbus A340-300 8 — 42 28 164 234 One painted in Star Alliance livery. Airbus A350-900 — 8 TBA 300 Deliveries from late 2019. Boeing 737-600 5 — 0 0 120 120 To be replaced by Airbus A320neo. Boeing 737-800 29 — 0 0 181 181 Three painted in Star Alliance livery. To be replaced by Airbus A320neo. Airbus A320neo 9 — 0 0 180 180 Operated by Scandinavian Airlines Ireland. On 20 June 2011, SAS announced an order for 30 new A320neo aircraft as part of its fleet harmonisation plan. SAS' stated goal is to have an all-Airbus fleet at its bases in Stockholm and Copenhagen by 2019, with a mixed A320neo and A320ceo fleet operation at both bases. The base in Oslo will then operate mostly Boeing 737-800 aircraft, with a few 737-700s also being retained. The older, smaller 737-600s will be disposed of. The first of the order of A320neos was delivered in October 2016. In April 2018, SAS announced an order of 50 more A320neos to replace all 737NGs and older A320ceos in service as part of its goal to have an all-Airbus fleet by 2023. On 25 June 2013, SAS and Airbus signed a Memorandum of Understanding stating that SAS intends to buy twelve new-generation aircraft, including six options. The agreement consists of eight A350-900s with six options, and four A330-300Es. The first new long haul aircraft to enter service will be the A330-300E, which were originally planned to replace the aging A340-300s in 2015 as leasing agreements on these aircraft expire. Instead SAS renewed the leasing agreements to be able to expand its long-haul fleet and used the new A330-300Es to add more long-haul destinations to its network. The A350-900 is planned to enter service in November 2019. SAS has dubbed this "a total renewal of long haul fleet", indicating that all former A340 and A330 will in fact be replaced, although the total renewal could also refer to the new interior in the long haul fleet. In September 2007, two separate incidents of similar landing gear failures occurred within four days of each other on SAS Bombardier Q400 aircraft. A third incident occurred in October 2007. On 28 October 2007, in a move that was described as unique by the Swedish press, the board of directors announced that all 27 Bombardier Q400 aircraft were to be removed from service due to the three landing gear failures. A press release from SAS said that the company had reached a settlement with Bombardier and Goodrich, whereby the airline would receive SEK one billion as compensation, while SAS would purchase 27 new aircraft, with an option of 24 more. These aircraft would consist of 13 of the Bombardier CRJ900 Nextgen (10 to SAS and 3 to Estonian Air) and 14 of the updated Q400 Nextgen units (8 to airBaltic and 6 to Widerøe), with 7 additional options. SAS received the first CRJ-900 on 3 December 2008. In November 2007, it was revealed that the Swedish Civil Aviation Administration began an investigation and accused Scandinavian Airlines System of cutting corners during maintenance. The airline reportedly made 2,300 flights in which safety equipment was not up to standard. The current livery was introduced in 1998, and is designed by SthlmLab (Stockholm Design Lab). SAS aircraft look predominantly white, however, the fuselage is in a very light beige (Pantone Warm Gray 2/Pantone 9083C) with "Scandinavian" above the windows in silver lettering (Pantone 877) and "Airlines" below the windows in white. The typeface used is Rotis Semi Serif. The vertical stabiliser (and winglets) are painted blue (Pantone 2738C) with the classic white SAS logo on it. It is a variant of the traditional SAS logotype, slimmed slightly and stylised by the design company Stockholm Design Lab, as part of the SAS livery change. The engine casing is painted in scarlet (Pantone Warm Red/Pantone 179C) with the word Scandinavian in white, the thrust reversers in the colour of the fuselage. All other text is painted in Pantone Warm Gray 9. The design also features stylised versions of the Scandinavian flags. All aircraft are named, traditionally after Vikings. Apart from the standard livery, SAS also has an Airbus A319 in retro livery and two Boeing 737s and one Airbus A340 in Star Alliance livery. On long-haul flights business class, called SAS Business, is still offered and features wide sleeper seats. On the Airbus A330s and upgraded Airbus A340s seating is 1-2-1 on seats that convert into 196–202 centimetres (77–80 in) flat beds, with power sockets and a 15 inches (380 mm) entertainment screen. On the single A340 that has not yet been upgraded, seating is 2-2-2 that converts into angled beds. Plus is SAS premium economy class. On intercontinental flights, seating is 2-3-2 on wide bodies. The seats offered on SAS Plus are wider than those in the SAS Go section. On European flights, SAS Plus tickets are refundable, and include a meal, a double checked-in baggage allowance, and access to lounges and fast track security at the airport. The SAS Plus passengers are seated at the front of the aircraft and passengers can choose their seat at booking for free, but the seats there are otherwise the same as the SAS Go seats. The two-class system was introduced in June 2013, when business class was eliminated from intra-European flights. SAS Go, or economy offers 3-3 seating on intracontinental flights, and 2-4-2 on the A330s and A340s. SAS offers free coffee and tea to GO passengers on short-haul services, except very short flights like Bergen-Stavanger or Stockholm-Visby. 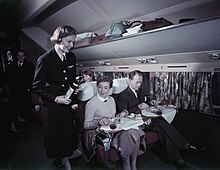 Meals are served to all passengers on long-haul flights. SAS Go Light is a variant of SAS Go with no checked luggage included. Tickets are sold in the same booking class as SAS Go and are otherwise identical. As of December 14 2017, SAS Go Light is available on both European and Long-haul flights. It is not available on flights within the Nordic countries. SAS Go Light is aimed at competing with low-cost carriers for those who travel with hand luggage only. Extra luggage allowance for EuroBonus Silver, Gold, and Diamond members does not apply on SAS Go Light tickets, and is only valid for EuroBonus Pandion members. In 2006, SAS Sweden launched a new biometric system for use throughout Sweden. Each passenger's fingerprints are, for security purposes, matched to their respective checked baggage. The new technology will be phased in at all the airports served by SAS, although use of the system is voluntary for passengers. The system has been introduced in Norway. SAS's frequent-flyer program is called EuroBonus. Members earn points on all SAS and Widerøe flights as well as on Star Alliance flights. The EuroBonus program has more than four million members. Fly Home Club was SAS's membership club for Scandinavians living in Spain. It has closed ever since economic conditions have worsened in Spain and as Scandinavians living in Spain have decided to return home or change locations. Between 1984 and 1994 SAS operated a hovercraft service between Malmö in Sweden and Copenhagen Airport in Denmark. Travellers could check in for their flights in Malmö and the hovercraft were operated as connecting flights. In 1994 the hovercraft were replaced by catamarans that operated until 2000 when the Öresund bridge was opened and offered a rail link between Malmö and Copenhagen airport. In May 2018, SAS launched a new high-speed WiFi system supplied by Viasat. The service is being rolled out on SAS short and medium-haul fleet and is expected to take two years to complete. The new system is much faster than previously available and will enable passengers to stream movies onboard. Prior to this SAS only offered WiFi on board on its long haul aircraft and a small number of Boeing 737s. WiFi is free for Eurobonus Gold and Diamond members as well as for those travelling in SAS Plus or Business. Otherwise, Wifi can be purchased with EuroBonus points or for a small fee. ServiceScore: Airline with highest service standards. ^ "About SAS". Retrieved 11 August 2018. ^ "SAS Annual Report Fiscal Year 2018" (PDF). ^ "Profile for SAS". Centre for Aviation. Archived from the original on 22 August 2012. Retrieved 22 August 2012. ^ "Route map - SAS" (PDF). Flysas.com. Retrieved 17 March 2014. ^ "About SAS Cargo - SAS Cargo/Airfreight". ^ Annual Report 2017 sasgroup.net Retrieved on 11 August 2018. ^ "SAS Scandinavian Airlines - Sas Scandinavian Airlines Information & Bookings Online - Musafir UAE - Musafir". www.musafir.com. Retrieved 10 January 2018. ^ "CityJet to Fly New Aircraft For SAS". www.cityjet.com. Retrieved 9 May 2016. ^ "Fra krystall til papp – etter over 70 år selger staten seg ut av SAS". Retrieved 3 October 2018. ^ Jacob-Phillips, Sherry. "Norway sells remainder stake in SAS airline". ^ "Norway to sell remaining SAS airline stake". 27 June 2018. ^ "SAS timeline More than 60 years in the sky" (PDF). flysas.com. Retrieved 2 November 2014. ^ "SAS – press release (in Swedish)". Cision Wire. Archived from the original on 15 July 2009. Retrieved 30 January 2009. ^ "Press Release: SAS Braathens to be renamed SAS Norge". Waymaker (via SAS Group Press Release Archive). Retrieved 23 March 2010. ^ Nicholson, Chris V. (1 October 2009). "SAS Sells Remaining Stake in BMI to Lufthansa". New York Times. Retrieved 18 November 2012. ^ Roberts, Martin; et al. (30 January 2009). "SAS sells Spanair for 1 euro, takes big charge". Reuters. Retrieved 18 November 2012. ^ "Company history". airBaltic.com. airBaltic. Retrieved 18 November 2012. ^ "Nightmare for trade unions in Copenhagen". Dagens Industri. 19 November 2012. Retrieved 17 December 2012. ^ "SAS Head Office in Sweden." Scandinavian Airlines. Retrieved on 27 January 2012. "SAS Head Office Stockholm-Arlanda Kabinvägen 5 SE-195 87 Stockholm"
^ "SAS head office in Sweden." Scandinavian Airlines. Retrieved on 8 June 2009. ^ "Cykelkarta 2007." Solna Municipality. Retrieved on 12 February 2010. ^ "Interim Report January-June 2011." Retrieved 30 December 2012. ^ "World Airline Directory." Flight International. 29 March 1986. "Scandinavian Airlines System" 122. ^ a b "SAS Group Annual report 2009" (PDF). SAS Group. Retrieved 7 September 2013. ^ "Annual Report & Sustainability Report 2010" (PDF). SAS Group. Retrieved 13 December 2011. ^ "Annual Report & Sustainability Report 2011" (PDF). SAS Group. Retrieved 24 August 2012. ^ "SAS Group: Year-end report January – October 2012" (PDF). SAS Group. Retrieved 30 December 2012. ^ "SAS Group: Y4th Quarter 2012" (PDF). SAS Group. Retrieved 7 September 2013. ^ "SAS Group Year‐end report November2012 – October2013" (PDF). SAS Group. Retrieved 14 March 2014. ^ "SAS Group Annual Report with Sustainability Review November 2013–October 2014" (PDF). SAS Group. Retrieved 1 March 2015. ^ "Resolutions approved by the 2012 Annual General Shareholders' Meeting of SAS AB". SAS Group. Retrieved 24 August 2012. ^ "Profile on SAS". CAPA. Centre for Aviation. Archived from the original on 30 October 2016. Retrieved 30 October 2016. ^ "AIR GREENLAND AND SAS ENTERS A NEW AND ENHANCED COOPERATION". Airgreenland.com. 21 August 2013. Retrieved 17 March 2014. ^ 31 July 2013. "The SAS Group's fleet in traffic". sasgroup.net. Retrieved 9 May 2014. ^ 13 February 2014. "SAS Fleet in Planespotters.net". planespotters.net. Retrieved 13 February 2014. ^ "SAS Fleet In 2005 Vs. 2015 - MRO content from Aviation Week". aviationweek.com. ^ "Photos: Airbus A319-132 Aircraft Pictures - Airliners.net". Retrieved 24 April 2015. ^ a b c "SAS places order for an additional 50 Airbus A320neo aircraft to create a single-type fleet - SAS". SAS. Retrieved 3 October 2018. ^ "SAS expands its fleet – leases three A321 Long Range - SAS". SAS. Retrieved 23 January 2019. ^ a b "SAS orders A330-300 to further standardize its future long-haul fleet". Airbus (Press release). Retrieved 12 April 2018. ^ "Photos: Airbus A340-313 Aircraft Pictures - Airliners.net". Retrieved 24 April 2015. ^ "SAS selects eight A350 XWBs and four A330s" (Press release). Airbus. 25 June 2013. Retrieved 25 June 2013. ^ "SAS signs with Airbus: Total renewal of long haul fleet - SAS". News.cision.com. 25 June 2013. Retrieved 17 March 2014. ^ a b "SAS styrer mod ren Airbus-flåde - CHECK-IN.dk". ^ "Photos: Boeing 737-883 Aircraft Pictures - Airliners.net". Retrieved 24 April 2015. ^ SAS. "SAS complements its production with a new air operator certificate (AOC) and bases outside Scandinavia - SAS". ^ "Scandinavian Airlines Takes Delivery of First Airbus A320neo". airwaysmag.com. Airways Magazine. Retrieved 22 June 2018. ^ Caswell, Mark. "SAS takes delivery of first A320 neo – Business Traveller". Business Traveller. Retrieved 22 June 2018. ^ "SAS Group - Press". Se.yhp.waymaker.net. 25 June 2013. Retrieved 17 March 2014. ^ "SAS removes Dash 8 Q400 from service permanently". Archived from the original on 2 November 2014. ^ "News." Airliner World : 7. ^ "Plane crash disaster narrowly avoided." The Copenhagen Post, 10 September 2007. Retrieved: 6 December 2009. ^ Elliott, Mark. "SAS revamps cabin classes". Travel Daily Media. Retrieved 12 June 2013. ^ "SAS the first Nordic airline to launch high speed WiFi - SAS". SAS. Retrieved 3 October 2018. ^ "SAS nominated as both the world's and Europe's most punctual airline". sasgroup.net. 17 January 2011. Retrieved 25 January 2015. ^ SAS - Scandinavian Airlines on Facebook. 1 October 2010. Retrieved 25 January 2015. ^ "Grand slam for SAS at Grand Travel Awards". sasgroup.net. 17 February 2011. Retrieved 25 January 2015. ^ "SAS wins Online Campaign of the Year award". sasgroup.net. 11 February 2011. Retrieved 25 January 2015. ^ "SAS wins social media award for second year in a row". sasgroup.net. 9 February 2012. Retrieved 25 January 2015. ^ SAS - Scandinavian Airlines on Facebook. 29 April 2013. Retrieved 25 January 2015. ^ SAS - Scandinavian Airlines on Facebook[dead link]. 5 July 2013. Retrieved 25 January 2015. ^ "Vinnarna i Grand Travel Award 2014". travelnews.se. 14 February 2014. Retrieved 25 January 2015. ^ "SAS kåret til Europas beste flyselskap". boarding.no. 22 January 2015. Archived from the original on 3 April 2015. Retrieved 25 January 2015. ^ "Sykes stor del i SAS-servicepris". tidningenharjedalen.se. 30 April 2015. Retrieved 30 April 2015.